Corvus Bellis are really nice little guys. A little to "active" for DBA stands. 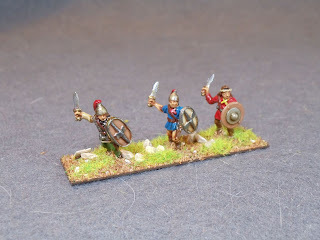 I found this anyway with my Marian Roman Corvus Bellis, fitting 4 of them on a 40x15mm stand. A little off topic Chris but you have 28mm Samurai on your work bench. You have a Impetus Samurai starter army then? 10mmGeneral- I received a pile of AEG Clan War minis in a trade. Added to that, I have a bunch of Kingsford with a small number of Perry. I'm planning on keeping the Clan War and Kingsford on separate bases as the Clan War is not actual historical but they'll suffice. The Perry's honestly, are considerably smaller than the Clan War or Kingsford so I'll probably not even use them. I'm using this page: http://hetairoiwargames.blogspot.com/ for my inspiration. Scott: Are those 40mm frontages? Or 50mm? Nice job with the paint! Bob- they're actually 60mm frontage. Is that a weird size? Beautiful painting. These guys look great Scott. Scott. 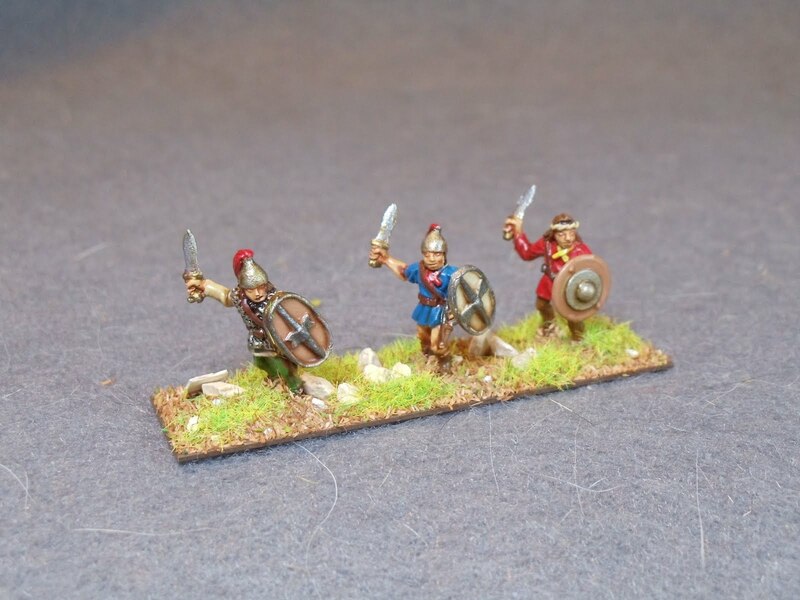 Most 15mm DBA is played with 40mm frontages; 60 tends to be reserved for 25mm figures. Scott, would you be willing to sell your Perry Samm's? If your willing to sell them, let me know what you have. I've never tried Impetus, just read it. Hope I can coax someone into running a game on an EWG gamenight.